The exhibition follows photography’s history with a fascinating collection of images and artefacts. There is a magical display of stereographs, camera collections, books and publications, and a small room showing a number of films, 4 or 5 minutes each, on various subjects e.g. the wet collodion process, the daguerrotype, etc. There were some historical images in this collection that I have only previously seen in books and it was a pleasure to view them closely. There are too many to mention here, but there is much more information on the V&A website. 2022 is to bring a further phase to the Centre including a new photography library, photographer’s studio and dark room. Just a few of the works that I enjoyed are noted here, including 29 Pictures within 5 minutes by Dieter Meier (1970). This simple idea of repeatedly photographing the banal scene of people sitting on benches in a street explores the nature of human behaviour whilst also commenting on the very practice of photography, the isolating of ‘a moment’, and aspects of voyeurism. Though provoking and timely was the image Contents of an Ostrich’s Stomach, F W Bond. 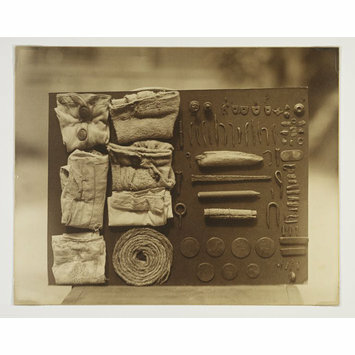 This image taken circa 1930 shows nails, buttons etc ingested by an ostrich in a zoo, eventually leading to its death and brought to my mind the recent news reports of catastrophic levels of plastic in our oceans and seabirds stomachs filled with manmade objects. The 1:1 scale of ‘The Latticed Window, Lacock Abbey‘ by Floris Neusüss is striking. Working at night, Neusüss covered the window with photographic paper and exposed it by shining a light from outside, creating a lifesize cameraless image of the famous window. 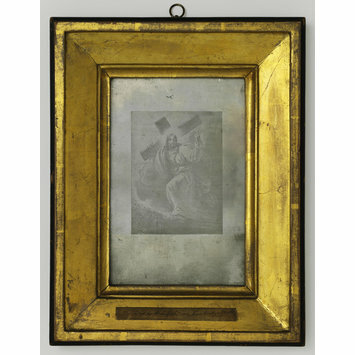 The image is displayed behind glass which acts too as a “mirror” allowing for multiple layers of interpretation. 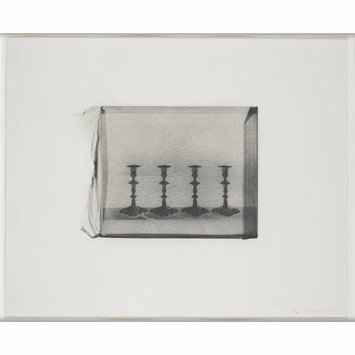 I often find photographic work that includes imperfections, reveals photographic materials or exposes the processes much more interesting than sharpened, ‘perfected’ images and so I also found myself drawn to Cornelia Parker’s ‘Four Silver Candlesticks’ and ‘Broken Tureen’ from ‘Thirty Pieces of Silver (Exposed)’. Created using a series of 1960s glass negatives (some broken), Parker exposed them but kept them in their bags. To end this post on the theme of exposing photography, the exhibition brings us full circle with works by Thomas Ruff: Linnaeus Tripe (2018), a series of large digital prints from digitally remastered scanned 19th Century negatives.